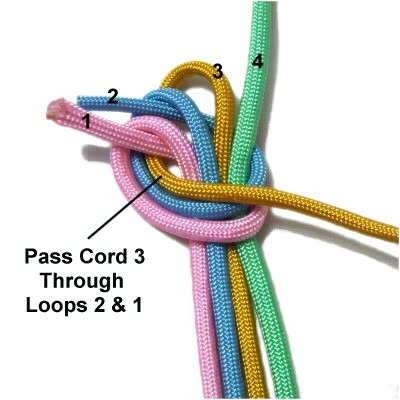 Description: The Matthew Walker knot features four cords linked together with Overhand knots. When finished, the design looks like a button knot. 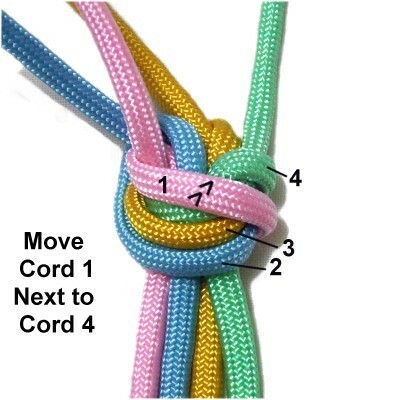 The cords rest diagonally in both the front and back of the knot. 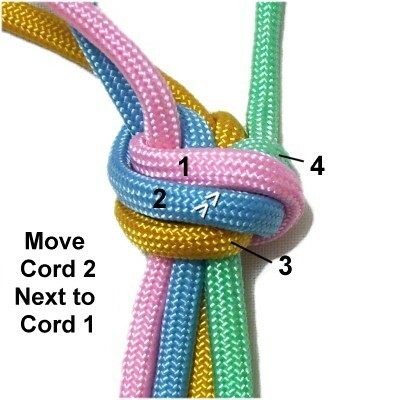 You can use any number of cords to make this knot, and it can also be tied with the separate strands making up one cord. 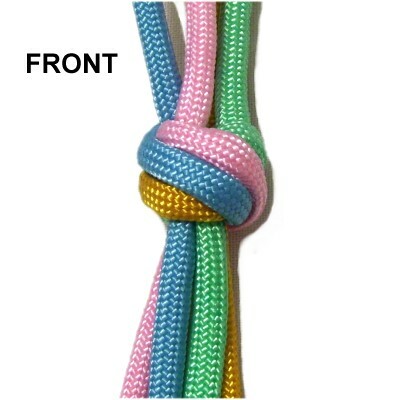 This is considered a finishing knot, since it's usually tied near the ends of the cords. You can cut off the excess material after the knot is tightened completely. Thanks goes to Paracord Guild, which has a YouTube video that helped me learn how to tie this knot properly. 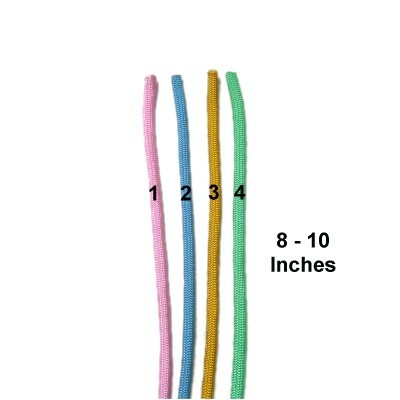 Preparation: To practice, you need four cords at least 18 inches long. Using four colors is optional, but helps when you are first learning this technique. Try to arrange your board upright if you plan to use one, to make it easier to arrange the cords properly. Step 1: Arrange the cords on your board vertically, securing them 8 to 10 inches from one end. You can make the Matthew Walker Knot while holding the cords in hand if you prefer not to use a board. Mentally number the cords 1 - 4 (left to right). 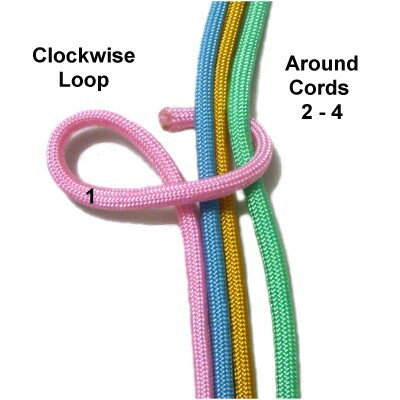 Make a clockwise loop with cord 1. Bring it around cords 2 - 4 (over - under), heading left. 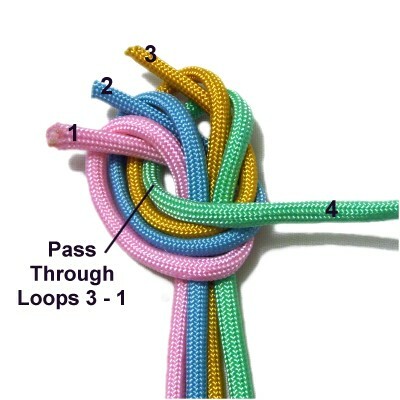 Complete the Overhand knot by passing the end through the loop under - over (from below). You can tighten the knot slightly, but leave room for the other cords to pass through the loop. 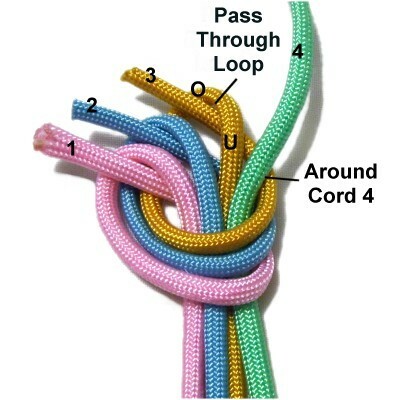 Step 2: Pass cord 2 through the first loop, then bring it to the right to make a clockwise loop. Make sure cord 2 stays above cord 1. Bring cord 2 around cords 3 and 4 heading left. 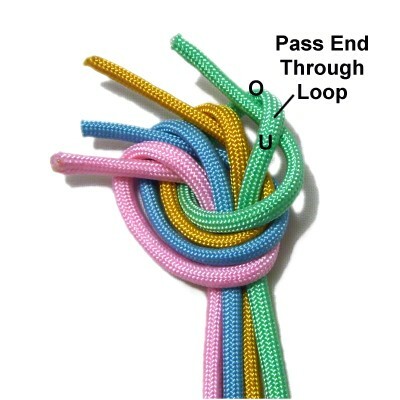 Complete the Overhand knot by passing the end through it's own loop under - over (from below). Step 3: Bring cord 3 through the loops made with cords 1 and 2. Move it to the right to make a clockwise loop. Make sure it stays above cord 2. Bring the end of cord 3 around cord 4 heading left. 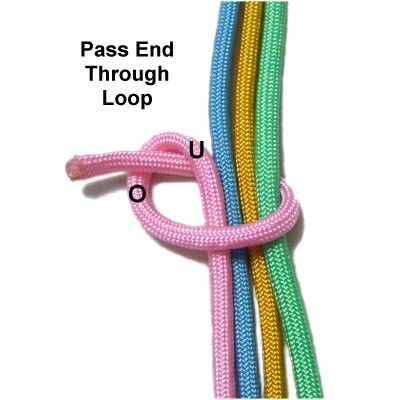 Complete the Overhand knot by passing it through it's own loop under - over. Step 4: Bring cord 4 through the loops made with the other three cords (3 - 1). Move it right to make the clockwise loop. 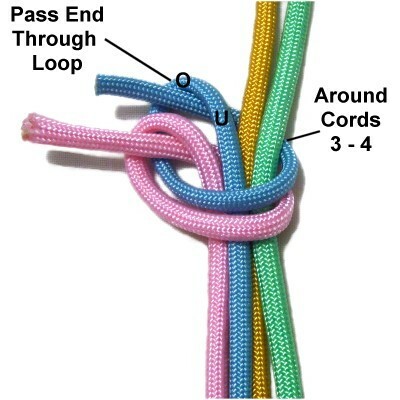 Complete the Overhand knot by passing the end of cord 4 through it's own loop under - over. 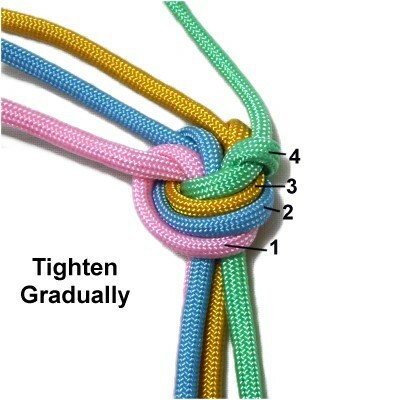 Step 5: Tighten the Matthew Walker Knot slowly and gradually by pulling on the ENDS coming out of the loops. You need to move two segments, so don't tighten too much. The cords should remain in the same order. Step 6: Slide cord 1 over cords 2 and 3, so it rests against cord 4. Step 7: Slide cord 2 over cord 3, so it rests against cord 1. The new arrangement is 4 - 1 - 2 - 3 (top to bottom). Step 8: Tighten all four cords again, keeping them in order. Remove all the slack this time, so the knot is FIRM. 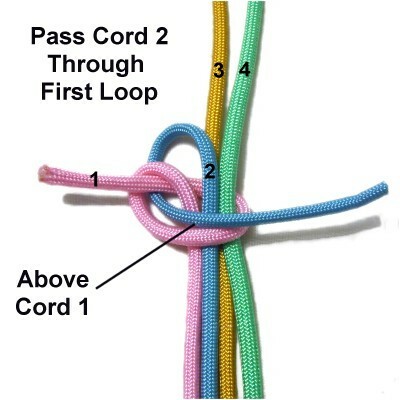 This image shows the front of the knot, which is what you've seen as you constructed it. 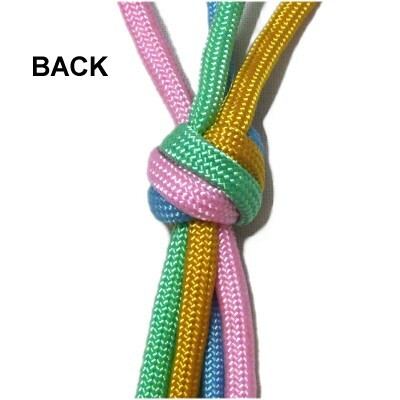 The back of the Matthew Walker Knot looks like the front, but the colors are in a different order. You can now cut off the excess material at the top of the knot (optional). Have any comments about the Matthew Walker Knot? Contact Me.